Read for This Week’s Study: Revelation 7; 2 Pet. 3:9-14; Deut. 8:11-17; Rev. 14:4-5, 12; Rev. 17:5; Rom. 3:19-24. Memory Text: “These are the ones who come out of the great tribulation, and washed their robes and made them white in the blood of the Lamb” (Revelation 7:14, NKJV). The opening of the seven seals shows us that every person who claims to believe in Christ will receive blessings for faithfulness or curses for unfaithfulness. The first four seals describe God’s disciplinary means to rouse His people from their spiritual lethargy and make them victorious. Yet, God’s people also suffer injustice and oppression in a world hostile to the gospel. At the opening of the sixth seal, God is ready to deal with those who harmed His people. Chapter 7 is an interlude inserted parenthetically between the sixth and seventh seals. The sixth seal brings us to the second coming of Christ. As the wicked face judgment, Revelation 7 answers their question about who will stand on the day of Christ’s coming: those who have been sealed, the 144,000. The other characteristics of the 144,000 are given in Revelation 14:1-5. There is also an interlude inserted between the sixth and seventh trumpets (Rev. 10:1-11:14). This interlude, which commences with the Second Great Awakening and the birth of the Advent Movement, coincides with the same time period as the opening scenes of chapter 7 and focuses on the experience and task of God’s end-time people. Study this week’s lesson to prepare for Sabbath, February 9. Read Revelation 7:1-3 along with 2 Peter 3:9-14. What does John see? How long are the angels supposed to restrain the winds? What will happen when the sealing is concluded? In the Old Testament, winds stand for destructive forces by which God executes judgments upon the wicked (Jer. 23:19-20; Dan. 7:2). “As the angels of God cease to hold in check the fierce winds of human passions, all the elements of strife will be let loose”. - Ellen G. White, The Great Controversy, p. 614. These destructive forces are being restrained by divine intervention while the sealing of God’s people takes place. In ancient times, the primary meaning of sealing was ownership. The meaning of the symbolic sealing in the New Testament is that “the Lord knows those who are His” (2 Tim. 2:19, NKJV). God recognizes His own people and seals them with the Holy Spirit (Eph. 1:13-14; Eph. 4:30). At the end-time, the seal on the forehead is given to God’s faithful people, who keep His commandments (Rev. 14:1, 12). It is not a visible mark put on one’s forehead, but as Ellen G. White states, it means “settling into the truth, both intellectually and spiritually, so they [God’s people] cannot be moved”. - Last Day Events, p. 220. In contrast, those who ultimately side with the beast receive the mark of the beast (Rev. 13:16-17). The faithfulness of God’s sealed people has been tested in every generation. However, the test of faithfulness in the final crisis will be the keeping of God’s commandments (see Rev. 12:17, Rev. 14:12). In particular, the fourth commandment will become the test of obedience to God (Rev. 14:7). As the Sabbath has been the sign of God’s people in biblical times (Ezek. 20:12, 20; Heb. 4:9-10), so it will be the sign of loyalty to God in the final crisis. At the time of the end, the seal also functions as a sign of protection from the destructive forces of the seven last plagues (see Ezek. 9:1-11 for the backdrop imagery of Rev. 7:1-3). Thus, the question raised in Revelation 6:17 receives the ultimate answer: those who will be able to stand protected on the day of God’s wrath are the sealed people of God. Paul warns us not to grieve the Holy Spirit by whom we have been sealed (Eph. 4:30). What does that mean? How does one grieve the Holy Spirit? Once you have your answer, what choices can you make to help you not to grieve Him? Read Revelation 7:4-8. What is the number of God’s sealed people? What is the meaning of that specific number? The announcement of the number of those who are sealed marks the completion of the sealing. John hears that their number is 144,000 from the 12 tribes of Israel. The reference here is not to a literal number but to what it signifies. The number 144,000 consists of 12 times 12 times 1,000. Twelve is a symbol of God’s people: the tribes of Israel and the church built upon the foundation of the Twelve apostles (Eph. 2:20). Thus, the number 144,000 stands for the totality of God’s end-time people: “All Israel” (Jews and Gentiles) who are ready for Christ’s return and who will be translated without seeing death (Rom. 11:26, 1 Cor. 15:51-53). The 12 tribes listed in Revelation 7 are, obviously, not literal, because the 12 tribes of Israel, encompassing both the Northern and Southern Kingdoms, are not in existence today. The 10 tribes of the Northern Kingdom were taken into captivity during the Assyrian conquest (2 Kings 17:6-23), where they became integrated with other nations. Thus, the 12 tribes do not constitute Judaism today. Also, the list of the 12 tribes in Revelation 7 is like no other found in Scripture (compare Num. 1:5-15; Ezek. 48:1-29). Judah is listed as the first tribe (Rev. 7:5) instead of Reuben (compare with Num. 1:5). Also, the tribes of Dan and Ephraim, included in the lists of Numbers 1 and Ezekiel 48, are omitted from the list in Revelation 7, while Levi and Joseph are included instead (Rev. 7:7-8). The obvious reason for the exclusion of Ephraim, and apparently Dan, from the list in Revelation 7 is that in the Old Testament these two tribes are apostate and idolatrous (1 Kings 12:29-30; Hos. 4:17). The list of the tribes in Revelation 7 is not historical but spiritual. The absence of Dan and Ephraim from the list suggests that the unfaithfulness of these two tribes will have no place among God’s sealed people. Also, the church in the New Testament is referred to as the 12 tribes of Israel (James 1:1). The 12 tribes in Revelation 7 stand for the entire people of God who endure to the end, both Jews and Gentiles. What Bible assurances does God give for those who will live through the time of trouble? Read Revelation 7:9-10. What group of saints does John see at this point? How are they described, and where do they come from? What are they shouting before God’s throne? John sees a “great multitude, which no one could number”, who came “out of the great tribulation, and washed their robes and made them white in the blood of the Lamb” (Rev. 7:14, NKJV). That is, they are a special group of people who, despite whatever tribulation they went through, have stayed faithful to Jesus, a faithfulness symbolized by their being covered in the robes of His perfect righteousness. The word “tribulation” is used very frequently in the Bible to refer to the things that believers suffer for their faith (see for example, Exod. 4:31, Ps. 9:9, Matt. 24:9, John 16:33, Rom 5:3). Therefore, although some Adventist interpreters view this group as another representation of the 144,000, we could understand the “great multitude” as a reference to all the redeemed who have suffered for their faith down through the ages. Here, too, in John’s description of the “great multitude, which no one could number”, we see, as we do in all the Bible, the great theme of salvation by grace. The only claim of the redeemed to salvation, to eternal life, to the new heavens and the new earth, is the righteousness of Christ, which is given to them by grace. “Nearest the throne are those who were once zealous in the cause of Satan, but who, plucked as brands from the burning, have followed their Saviour with deep, intense devotion. Next are those who perfected Christian characters in the midst of falsehood and infidelity, those who honored the law of God when the Christian world declared it void, and the millions, of all ages, who were martyred for their faith. And beyond is the ‘great multitude, which no man could number, of all nations, and kindreds, and people, and tongues, … before the throne, and before the Lamb, clothed with white robes, and palms in their hands’. Revelation 7:9. Their warfare is ended, their victory won. They have run the race and reached the prize. The palm branch in their hands is a symbol of their triumph, the white robe an emblem of the spotless righteousness of Christ which now is theirs”. - Ellen G. White, The Great Controversy, p. 665. Yes, we are covered with the righteousness of Christ, a gift of faith. But how can we maintain that faith and stay faithful amid trials and tribulation? Or, even more important, how do we maintain that faith and faithfulness in times of ease and prosperity? (See Deut. 8:11-17). Read Revelation 14:1-5. What are the three chief characteristics of the 144,000 saints? How are these characteristics related to the description of the end-time saints in Revelation 14:12? Revelation 14:4-5 is a description of the 144,000 that aligns with God’s last day people who “keep the commandments of God, and the faith of Jesus” (Rev. 14:12). Although they experienced the fullness of Satan’s wrath in the final crisis, they have remained firm because of their close relationship with Jesus. In light of Revelation 17:5, in what sense have the 144,000 not been defiled with women? How is the purity of their character related to the fact that they are redeemed from the earth as the “firstfruits to God” (Rev. 14:4-NKJV)? Sexual immorality is a symbol of unfaithfulness to God. Revelation 17:5 talks about the end-time harlot Babylon and her daughters, with whom all the people of the world will commit fornication (see also Rev. 18:3). However, the 144,000 will remain loyal to Christ and resist the defiling relationships with Babylon and the apostate churches. The 144,000 “follow the Lamb wherever He goes” (Rev. 14:4, NKJV). The 144,000 are further described as the ones who have been “redeemed from among men” as “firstfruits to God and to the Lamb” (Rev. 14:4, NKJV). In ancient Israel, the firstfruits were the best fruits of the harvest offered to God (Num. 18:12). The word “firstfruits” can refer to saved people as distinct from those in the world (James 1:18), but in Revelation the 144,000 are clearly a special group because they will be translated without seeing death (1 Cor. 15:50-52). Thus, they are the firstfruits of the larger harvest of the saved through all the ages (Rev. 14:14-16). What are ways we can, even unknowingly, be in danger of committing spiritual fornication? Why do we delude ourselves if we think we are not in such danger? Read Revelation 14:5 along with 2 Peter 3:14 and Jude 24, 25. Revelation describes God’s end-time people as “without fault”. How is this state achievable? The final characteristic of the 144,000 is that “in their mouth was found no guile: for they are without fault before the throne of God” (Rev. 14:5). While the people of the world choose to believe Satan’s lies, God’s end-time people, who are without deceitfulness in speech or conduct, will receive the love of the truth so as to be saved (2 Thess. 2:10-11). “Without fault” (Greek amomos, “blameless”) refers to the fidelity of the 144,000 to Christ. In the Bible, God’s people are called to be holy (Lev. 19:2, 1 Pet. 2:9). Abraham (Gen. 17:1) and Job (Job 1:1) were blameless. Christians are called to be holy and without blemish before God (Eph. 5:27, Phil. 2:15). Read Romans 3:19-24. Why must we always keep this crucial truth before us? In the closing days of this world’s history, the 144,000 will reflect the character of Christ. Their salvation will reflect what Christ has done for them and in them rather than their own holiness and works (Eph. 2:8-10). The 144,000 have washed their robes and made them white in the blood of the Lamb (Rev. 7:14) and, as such, are found “spotless and blameless” before God (2 Pet. 3:14, NASB). When the conflict of life is ended, when the armor is laid off at the feet of Jesus, when the saints of God are glorified, then and then only will it be safe to claim that we are saved, and sinless”. - Ellen G. White, Selected Messages, book 3, pp. 355, 356. How can we live a life of sanctification in active preparation for eternity and yet not suffer from the pitfalls of perfectionism and fanatical holiness? Further Thought: Read Ellen G. White, “Sinlessness and Salvation”, pp. 353-357, in Selected Messages, book 3. The identity of the 144,000 is a hotly debated issue. What seems evident in Revelation is that the 144,000 are the last generation of God’s people in the closing days of this earth’s history. We know that they will go through the time of trouble and be protected from the seven last plagues (Ps. 91:7-16) and that their loyalty will be tested like no generation in the past. “Christ says that there will be those in the church who will present fables and suppositions, when God has given grand, elevating, ennobling truths which should ever be kept in the treasure house of the mind. When men pick up this theory and that theory, when they are curious to know something it is not necessary for them to know, God is not leading them. It is not His plan that His people shall present something which they have to suppose, which is not taught in the Word. It is not His will that they shall get into controversy over questions which will not help them spiritually, such as, Who is to compose the hundred and forty-four thousand? This those who are the elect of God will in a short time know without question”. - Ellen G. White, Selected Messages, book 1, p. 174. Think of the following admonition: “Let us strive with all the power that God has given us to be among the hundred and forty-four thousand”. - Ellen G. White Comments, The SDA Bible Commentary, vol. 7, p. 970. How can you put these words into practice? How does this striving impact your daily decisions? An important characteristic of the 144,000 end-time saints is the singing of the new song. It is a song that no one else can sing because it is the song of experience - an experience that no other group in history ever had (Rev. 14:3-4; Rev. 15:2-3). As you think of your own life, how does your present spiritual walk reflect a song of a fresh experience with God? Or does your life reflect your past stale stories of God’s works in your life, lacking evidence of present commitment? What changes can you make right now to help you recommit your life to Him? What is the difference between just knowing about Christ and truly knowing Him? If someone were to ask you “What is Christ like?” what would you answer, and why? Lena Engel made a list of the qualities that she sought in her future husband after she broke up with her first boyfriend. At the top of her list: a spiritual person. He must be organized, accept responsibility, and have leadership qualities. She also wanted someone with similar hobbies like exercising and nature. Lena’s mother shook her head. “You’ll have a hard time finding a man like this”, she said. Lena, a German native, met her first boyfriend in high school and, after graduating, left him in Europe so she could work for a year as a mission teacher in the South American country of Guyana. In the jungles, she reflected about her boyfriend and realized that she had pursued the relationship based on feelings. Back in Germany, Lena ended the relationship and made the checklist that she showed to her mother. Months passed, and Lena immersed herself in university studies without any time or interest in marriage. One morning during personal devotions, she felt impressed to read Ellen G. White’s “Letters to Young Lovers” and make a new list. The list ended up being 75 percent new, cutting through feelings and culture to reach the heart of a relationship (read the list at the link: bit.ly/lenas-list). With the list in hand, Lena saw ways to improve in her own life. She wondered where she would find a man who met the criteria. Immediately she remembered Gerson. Lena had met Gerson, a fellow German missionary, in Guyana, and they had taught at the same high school for several months. They remained friends in Germany. Although Lena had been taught to allow the man to take the lead, she made her interest clear to Gerson the next time that they met at a church event. Gerson joyfully recognized her interest but resolved to seek God’s approval before revealing his own feelings. For three months, he read the Bible, “Adventist Home”, and “Letters to Young Lovers” to gain a better understanding of God’s will for marriage. Finally, he realized that he and Lena shared similar principles and, with the blessing of his parents and grandparents, reached out to Lena. 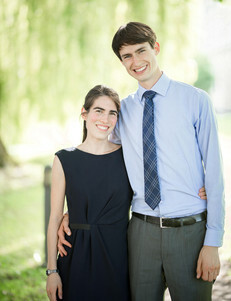 Today, Lena and Gerson Engel are happily married and teach at Bogenhofen, a Seventh-day Adventist boarding school in Austria.